The structure indicated is the posterior inferior tibiofibular ligament. The distal ends of the tibia and the fibula are held together by the inferior portion of the interosseous membrane. The interosseous membrane is the membrane which joins the tibia to the fibula along its entire length, separating the leg into anterior and posterior compartments. There are two apertures within the interosseous membrane proximally and distally which allow vessels to pass from one compartment to the other. In addition to the attachment of the interosseous membrane inferiorly between the distal tibia and fibula, this inferior articulation is reinforced by the tibiofibular ligaments anteriorly and posteriorly. 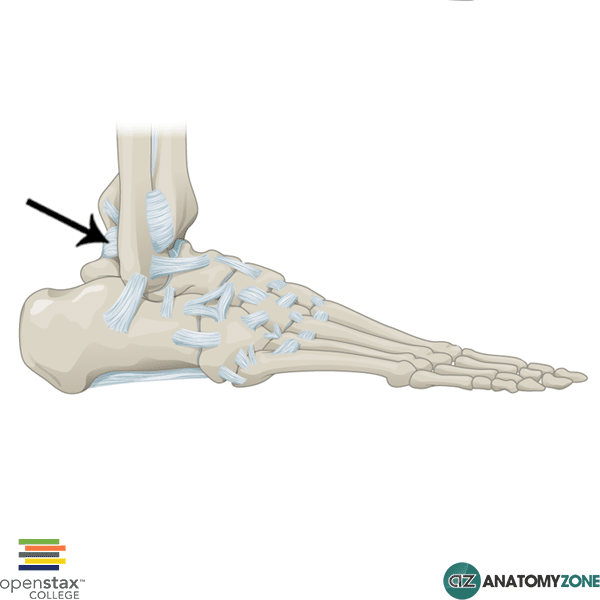 Learn more about the anatomy of the tibia and fibula in this tutorial.